Look to the southwest after sunset on Dec. 1 for a close conjunction between three bright solar system objects: the Moon, Venus, and Jupiter. If you have binoculars, you might even be able to fit all three of them in the field of view. Between now and then, you can see Jupiter and Venus getting closer together each evening. Every once in a while, something will appear in the night sky that will attract the attention of even those who normally don't bother looking up. It's likely to be that way on Monday evening, Dec. 1. A slender crescent moon, just 15-percent illuminated, will appear in very close proximity to the two brightest planets in our sky, Venus and Jupiter. People who are unaware or have no advance notice will almost certainly wonder, as they cast a casual glance toward the moon on that night, what those two "large silvery stars" happen to be? Sometimes, such an occasion brings with it a sudden spike of phone calls to local planetariums, weather offices and even police precincts. Not a few of these calls excitedly inquire about "the UFOs" that are hovering in the vicinity of our natural satellite. Venus has adorned the southwestern twilight sky since late August. No other star or planet can come close to matching Venus in brilliance. During World War II, aircraft spotters sometimes mistook Venus for an enemy airplane. There were even cases in which Venus drew antiaircraft fire. This winter, Venus is the unrivaled evening star that will soar from excellent to magnificent prominence in the southwest at nightfall. The interval by which it follows the Sun will increase from nearly three hours on Dec. 1 to almost four hours by Jan. 1. It's probably the first "star" you'll see coming out after sunset. In fact, if the air is very clear and the sky a good, deep blue, try looking for Venus shortly before sunset. Jupiter starts December just above Venus and is moving in the opposite direction, dropping progressively lower each evening. By month's end Jupiter meets up with another planet – Mercury – but by then Jupiter is also descending deep into the glow of sunset. In January, Jupiter will be too close to the Sun to see; it's in conjunction with the Sun on Jan. 24. 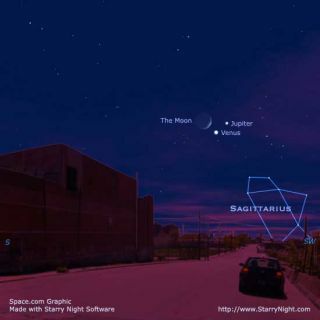 A very close conjunction of the crescent moon and a bright star or planet can be an awe-inspiring naked-eye spectacle. The English poet, critic and philosopher, Samuel Taylor Coleridge (1772-1834) used just such a celestial sight as an ominous portent in his epic, "The Rime of the Ancient Mariner." In addition, there are juxtaposed crescent moon and star symbols that have appeared on the flags of many nations, including Turkey, Pakistan, Malaysia, Algeria, Mauritania, and Tunisia. Also on Monday evening, you may be able to see the full globe of the moon, its darkened portion glowing with a bluish-gray hue interposed between the sunlit crescent and not much darker sky. This vision is sometimes called "the old moon in the young moon's arms." Leonardo da Vinci (1452-1519) was the first to recognize it as what we now call "earthshine." As seen from the moon, the Earth would loom in the sky some 3.7 times larger than the moon does for us. In addition, the land masses, the oceans and clouds make the Earth a far better reflector of sunlight as compared to the moon. In fact, the Earth's reflectivity varies as clouds, which appear far more brilliant than the land and seas, cover greater or lesser parts of the visible hemisphere. The result is that the Earth shines between 45 and 100 times more brightly than the moon. The Earth also goes through phases, just as the moon does for us, although they are opposite from what we see from Earth. The term for this is called "complementary phases." On Nov. 27, for example, there was a new moon for us, but as seen from the surface of the moon that day, there appeared in the lunar sky a brilliant full Earth. A few nights later, as the sliver of a crescent moon begins to appear in our western twilight sky, its entire globe may be glimpsed. Sunlight is responsible for the slender crescent, yet the remainder of the moon appears to shine with a dim blush-gray tone. That part is not receiving sunlight, but shines by virtue of reflected earthlight: the nearly full Earth illuminating the otherwise dark lunar landscape. So earthshine is really sunlight which is reflected off Earth to the moon and then reflected back to Earth. Keep in mind that this head-turning display of three celestial objects crowded together will be merely an illusion of perspective: the moon will be only about 251,400 miles (403,900 km) from Earth, while Venus is nearly 371 times farther away, at 93.2 million miles (149.67 million km). Meanwhile, Jupiter is almost 2,150 times farther away than our natural satellite at 540.3 million miles (869.0 million km). Those using binoculars or a small telescope will certainly enjoy the almost three-dimensional aspect of the moon, but Venus will be rather disappointing appearing only as a brilliant blob of light, for right now, it's a small, featureless gibbous disk. That will change in the coming weeks, however, as Venus approaches Earth and the angle it makes between us and the Sun allows it to evolve into a "half-moon" phase in mid January, and a lovely crescent phase of its own during the latter part of February and March. Jupiter on the other hand is a far more pleasing sight with its relatively large disk, cloud bands and its retinue of bright Galilean satellites. All four will be in view on Monday evening, with Callisto sitting alone on one side of Jupiter, Ganymede, Io and Europa will be on the other side. Io and Europa will in fact, appear very close to each other, separated by only about one-sixth the apparent width of Jupiter. As beautiful as the view of Venus, Jupiter and the moon will be from North America, an even more spectacular sight awaits those living in parts of Western Europe where the moon will pass in front of Venus. Astronomers refer to this phenomenon as an "occultation," taken from the Latin word occult?re, which means "to conceal." This eye-catching sight will be visible in complete darkness across much of Eastern Europe. Farther west, Venus will disappear behind the dark part of the moon either during evening twilight or just before the Sun sets. When Venus emerges, it will look like a brightening jewel on the slender lunar crescent. For virtually all of Europe, the Sun will have set by then, the exception being southern Portugal (including Lisbon). Such favorable circumstances are quite rare for any given location. For example, the last time London was treated to such a favorably placed Venus occultation such was back on October 7, 1961. And after 2008, there will not be another similarly favorable Venus occultation for the United Kingdom until January 10, 2032. So be sure to make the most of this upcoming opportunity. More detailed information, including maps of the occultation zone, as well as times for dozens of European cities, are here.